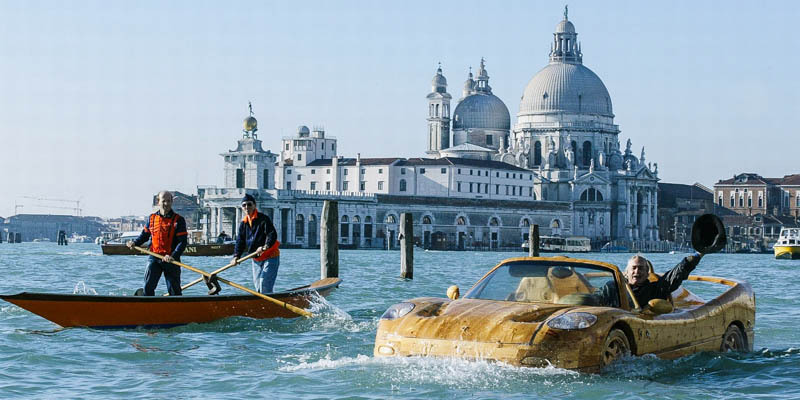 Venetian artist Livio De Marchi (Liviodemarchi.com) driving his hand-made wooden Ferrari in the Bacino San Marco. Kids, don't try this at home (or in Venice). No, you cannot drive in Venice—but you can drive to Venice, leave your car in a garage or lot, and proceed to enjoy the city of canals car-free. Since parking costs €24–€29 per day, it's a good idea to return your rental car upon arrival in Venice. Venice lies on the major A4 autostrada that runs east-west across Northern Italy though the Po Valley, from Turin past Milan, Brescia, Lake Garda, Verona, Vicenza, and Padova to Venice (and on to Trieste). Exit the A4 at Venezia-Mestre, and follow signs for Venezia - Centro Storico (or simply ones that say "Venezia" with that little black-on-white bulls eye symbol, which is international for "city center"). You'll end up on Via della Libertà in Mestre. (Sometimes referred to as Venezia-Mestre, this sprawling, industrial, landlubbing suburb is technically a part of Venice but is as far from being what the tourist thinks of as "Venice" as Detroit is from being "Key West.") If you keep following signs for "Venezia" and centro storico, Via della Libertà becomes a causeway over the lagoon called Ponte della Libertà. On the other side of the causeway, you'll arrive at a large square called Piazzale Roma, which serves as a bus terminus and turn-around spot, because this is the only bit of Venice accessible by car—crazy local artists like Sr. De Marchi, up on the left there in one of his floating wooden cars, notwithstanding. Once you arrive in Venice, you'll have to park your car. At the risk of stating the obvious, there are no cars allowed in Venice at all. It's a bit hard to drive on all that water, see. You can save 5% low season, 10% high season—and guarantee yourself a spot—by booking 15 days ahead of time through the website. Pull into the first garage on your right (the cheapest of the bunch) and park your car for the duration of your stay. This is the official ASM Venezia car park (tel. +39-041-272-7211, Avmspa.it), with room for nearly 2,300 vehicles, open 24/7, and charging €23.40 to €29 per day, depending on size of car and whether you book ahead (see the box on the right). If the ASM garage is full, there are a few other private lots and garages on Piazzale Roma, though they'll cost a bit more. On Piazzale Roma there is a vaporetto (water bus) stop for the Grand Canal Lines 1 (commuter), 2 (express; the old Line 82) and N (night). An artificial island just behind Piazzale Roma called Tronchetto. Back on the Mestre mainland in the S. Giuliano lots. The first option is to backtrack around behind Piazzale Roma to an artificial island called Tronchetto. The Tronchetto garage (tel. +39-041-520-7555, Veniceparking.it) has more than 4,800 parking spaces (plus an open lot for oversized campers) and charges €3–€5 per hour or €21 per day—though, if you'll be staying for more than three days and pay for the entire stay upon arrival, you will receive a 20% discount. There's a vaporetto stop on Tronchetto for the no. 2 line (and, in summer, a lot of touts trying lure you to their water taxis—unless you are made of money, just ignore them). There's also now the Venice People Mover—a fancy name for a small shuttle train (picture one of those terminal-to-terminal connectors at a large airport). Buy the €1.30 ticket at a machine, stay on at the first stop (Marittima—the cruise terminal) and four minutes later get off at the end, Piazzale Roma. It runs every 10 minutes, Mon-Sat 7am–11pm, Sun 8am–10pm (Nov-Mar 8:30am–9pm). You could also grab the no. 6/ bus to Piazzale Roma (just one stop). The second option for true penny-pinchers (€12 per day) are the lots of S. Giuliano back on the mainland in Mestre, by the shore to the left (north) of the causeway over to Venice proper. Though sadly, in late 2014, the cost skyrocketed from €5 to €12, this is still a bargain. Just follow the "P" signs to the official S. Giuliano lots, which are operated by ASM Venezia (tel. +39-041-532-2632, Avmspa.it). There are actually three lots at S. Giuliano. The one you want is Parcheggio Porta Gialla (yellow), which is open 24 hours a day (and can handle campers), which is free for up to three hours, then charging a mere €2 for four hours, €4.50 for five hours, €8 for six hours, then €12 per day, or €60 for a monthly pass (which is already cheaper than three days at the Piazzale Roma or Tronchetto lots). The other two lots—Parcheggio Porta Rossa (red) and Parcheggio Porta Blu (blue)—are day-use lots only—no overnight parking—open from 6am to 2am and charging €2 for the first four hours, €4.50 for five hours, €8 for six hours, and €12 for a full day. All three lots operate on a keen new system that doesn't involve tickets; a camera reads your license plate when you arrive, and then again as you go to leave, and charges you accordingly. Note: The automated payment machines take cash or credit cards, but do not give change, so when in doubt, use a credit card. Astoundingly cheap, yes, but do note that you'll have to take a city bus (no. 5, 12, 12/, 19, or 24) from Parco S. Giuliano one stop to Piazzale Roma (7 minutes, €1.30). Also, if the lots at Piazzale Roma and Tronchetto are both filled, then the city is probably bursting at the canals with tourists as well, so fair warning.